A is for Arthur, B is for The Beatles, C is for Carnival. 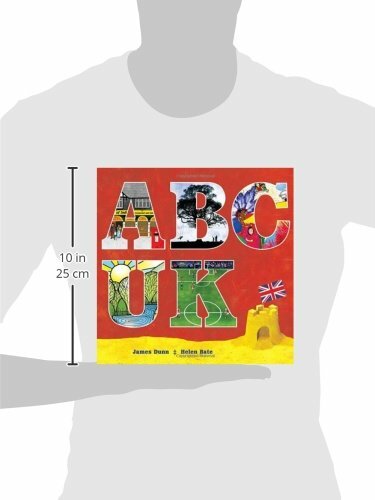 So begins this alphabet book about all things British. It surely is ‘Amazing, Brilliant, Creative; a celebration of the UK and its vibrant cultural identity.’ Each page is devoted to one letter, (apart from a necessary double page spread for, eg, Llanfairpwllgwyngyllgogerychwyrndrobwllllantysiliogogogoch!). Every page-turn brings a surprise, both in the choice of subject and the startling illustration. Stonehenge is there, alongside Tea… it’s the Mad-Hatter variety… and the Queen, with orb and corgi. Holmes appears with pipe and magnifying glass; Vis for vindaloo. Look at the rainy reflections in Wfor wellies, and Mary Quant, surrounded with 60s fabric designs, alongside the red Mini. Ois for oak, a wonderful silhouette, opposite a couple of Punks… one almost reaches out to turn down the volume! At the end, the Alphabet Glossary shows each picture in miniature with an annotation. There is the story behind the Giant’s Causeway; the rules of Football originally being laid down in Manchester, and the warning never to enquire of a Scot what he wears under his Kilt! A delightful book to share, for there is something to entertain, amuse and instruct throughout. It is a joy… and for those many collectors of alphabet books, this one is rich booty indeed.